A few days ago I was chatting with a friend in Ohio, who happened to tell me about her colleague’s unfortunate road accident last September. My friend was having trouble with coming to terms with the financial consequences her colleague had to face due to medical bills post his treatment. The accident not only physically crippled him for the rest of his life but also left him in massive debt. His family had to eventually file for bankruptcy. Millions of insured and uninsured Americans face medical bankruptcy each year. The issue is so serious that every 3 out of 5 bankruptcies filed in the US are due to medical bills. In addition, the US is the only developed country where cost of care can leave patients bankrupt. 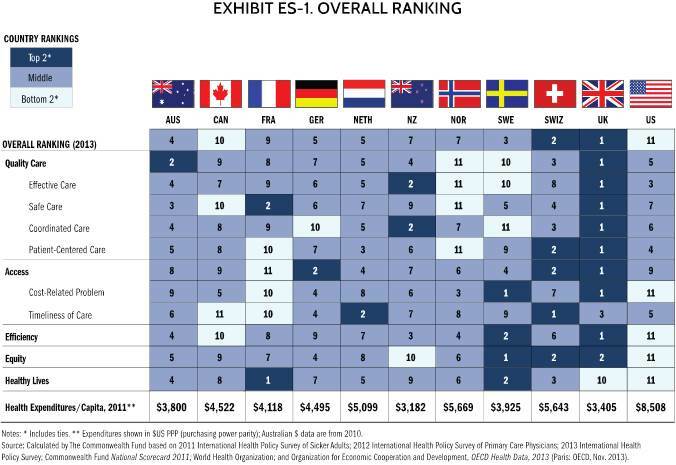 According to a recent survey conducted by The Commonwealth Fund, health care in the US ranks last among 11 other developed countries considered in the study. It lags behind most countries on parameters such as Quality Care, Access, Efficiency and Healthy Lives. Moreover, the expenditures in America are more than double the average of rest of the nations. This brings us to question what the US can learn from the best in the field. What are these countries doing right that enable them to achieve stellar results in quality and access while at the same time keeping the costs under control? One of the key difference in between the US and rest of the nations included in the study is that all other countries have universal healthcare system. Intuitively, such a system might be considered wrought with long waits, delayed treatments and basic lack of compassion. But the truth is far from it. It has been proved time and again that universal healthcare achieves better results in quality and at lower costs compared to other systems. For instance, the NHS in the UK is one of the best examples of how universal healthcare system achieves healthcare goals of a nation within reasonable costs. Furthermore, the hospital charges in the US are unregulated and far exceed the rest of the nations. In countries like Switzerland, the government ranks hospitals from most to least expensive which then serve as a benchmark for hospitals and insurers on how much to charge for their services. Data also suggests that there is a trend of over-testing and over-treating patients in the US compared to other industrialized nations. For example in UK, the Diagnostic Advisory Committee that has put in place guidelines to put in-check such practices. Although there is no one nation that has perfected all aspects of healthcare delivery, it always makes sense to adopt certain models and features that have withstood the test of time. This is true especially when one is way off the mark from rest of the players in the field.